Over the last year or so, I’ve been involved with the planning and design of the public space that will accompany some of the first re-developments in the Transit Village/Boulder Junction, mostly Pearl Parkway between 30th St. and the railroad tracks. I’ve primarily given feedback as a cyclist and pedestrian — someone who uses our streets under my own power. Even in Boulder, those of us who don’t own, and only very rarely use private motor vehicles are still unusual. Nevertheless, the long term goal of the TVAP is to have 60% of all trips in the region done by foot, bike or transit — anything but the much loved and loathed single occupancy vehicle (SOV). I was particularly taken by something Tim Plass said in the PLAN-Boulder election forum this fall when asked to envision Boulder 30 years in the future: Every once in a while you’ll see an electric car on the road, but mostly it’ll be bikes and pedestrians and transit. I agree with these goals; we should pursue them vigorously. But the city being described by Plass and the TVAP is very different from the status quo today, and it’s difficult to take the steps necessary to realize it. Sometimes I think of myself as a time-traveling constituent from this future city, describing what it is that we will want then, when the majority of people aren’t driving a private car everywhere they go. One thing that I’m confident we won’t want is so much “free” parking. How Much Does “Free” Parking Really Cost? Parking often plays a surprisingly central role in our transportation and planning decisions. Without it private automobiles are rendered useless, but it requires a lot of precious urban space, and it’s fabulously expensive — each parking space in a structure costs $15,000-$40,000 to build. Surface parking is cheaper of course –$8,000-$15,000/space — but it destroys the fabric of cities by pushing places of interest away from each other, making car-centric cities hopelessly unfriendly to pedestrians, cyclists and transit users. Yet somehow, despite its enormous impact, copious “free” parking is generally treated as an inalienable right by both developers and cities. Its cost is hidden and almost completely socialized. Each of us pays roughly the same amount for parking regardless of whether we own 4 cars or none, because the cost of parking is bound up in the cost of nearly all the goods and services (not to mention real estate) we purchase. Broad ignorance of the real value and cost of parking results in some surreal discussions. An example: the first agenda item at the Transportation Advisory Board (TAB) meeting last Monday was the expansion of the Neighborhood Parking Program (NPP) district on University Hill. The problem is that lots of students, faculty and staff at the university don’t want to pay for an on-campus parking permit, preferring to park in nearby neighborhoods. This ends up making it difficult for residents to park in front of their own houses. The district has been slowly expanding for years, forcing “commuters” (many of whom actually live in Boulder and could bike or ride the bus instead) to park ever further from the university. Residents purchase an annual neighborhood parking permit for $17. At that price, the program can’t even pay for the signage and man-hours required to run it. Commuters may also buy neighborhood permits, for $78 per quarter ($312/year). Some members of TAB were concerned by the ad hoc nature of the University Hill parking district’s ongoing expansion. “When will it stop?” they asked, somewhat incensed. Staff had no answer, and that’s the surreal part, because there’s nothing mysterious going on here. The parking district will stop expanding when the cost (inconvenience) of parking for free just outside the parking district on the Hill and walking (or biking, or taking the bus) to campus, is slightly greater than the cost of buying a CU permit. (Remote lot parking permits at CU cost about $120/year; more convenient spots go for closer to $600.) On-street parking is finite and valuable, and it’s being given away for free. It’s not surprising that this results in queuing (think Soviet era bread lines). There’s some participation in the commuter permit program, but it isn’t as popular as the city would like, probably because people feel that buying a campus permit or walking from outside the parking district is a better value. Of course it might also be convincing people to use their RTD pass, or bike to CU. We can hope, anyway. Valuing an on-street parking spot isn’t easy. There’s only so much curbside space to be allocated, and demand is often large, because they’re so convenient. Just as a point of reference, a metered space downtown brings in around $7,000 per year, most of which is re-invested in the downtown business district’s infrastructure. I’m not some kind of market zealot — I believe in the value of some public goods — but here I just don’t see the case. NPP districts continue to give the parking away essentially for free, but restrict its use to only the people who live right by it, functionally converting the public right-of-way into private property. Ironically, the city is often usurping private property in the first place, in order to provide that right-of-way. It would be simpler to just give the property back, and let the owners store their vehicles on it. Or not — they might decide to use that space in some other way instead. Neighborhood permit parking also fails if you try and scale it up, city wide. If you’re allowed to park in front of your own house but nowhere else, then you can’t actually take your vehicle anywhere! Whereas letting anyone park anywhere for free results in queuing, NPP is the equivalent of preferential rationing. It’s a centralized and inflexible resource allocation decision. One obvious solution is to meter the parking, and keep increasing the price until you have some target occupancy rate, allowing those who wish to pay to park to find a space easily. One could also imagine a hybrid metered/NPP arrangement, in which residents can park at home for free (with a meter exemption permit for that block), but they have to pay the going rate when they park in other neighborhoods. In the case of University Hill, the equilibrium prices would end up reflecting people’s willingness to walk from distant parking, the price of the permits for on campus parking, and their willingness to eschew the car altogether. If the meter revenue were dedicated to improvements within their neighborhood (as it is with the downtown general improvement district) residents might not even complain about it too much. Again, we can hope, anyway. In the Boulder Junction/Transit Village area the city is managing parking in a slightly different way. Within the area covered by the TVAP, residential units are subject to parking maximums. That is, each residential unit will have no more than one parking space associated with it. So the 319 unit apartment complex at 3100 Pearl Parkway will have only 319 parking spaces in its underground garage. Another 70 unit development will be built by the bus terminal and plaza to the north of Pearl Parkway. It will have 70 designated spaces in a shared district/RTD parking structure. In this one block, there will be about 400 residential units, housing perhaps 1000 people. According to the developers, at least 600 parking spaces will be needed to service this population. The plan is to satisfy any additional demand with parking spaces that are shared between RTD, the planned hotel, and the district at large, within a single structure. The city has been incorrectly referring to this arrangement as “unbundled parking.” It’s really “shared district parking,” and it ought to reduce the number of spots that need to be provided overall. This is because the times of peak parking demand for RTD, the local residences, the hotel, and retailers will be somewhat different, leading to more complete utilization of a very costly resource. Clearly, this is an improvement over having two huge parking structures across the street from each other, one of which (the Park-n-Ride) is full during the day, while the other (associated with the apartments) is full only at night. However, truly unbundled parking is far more potent. It completely separates (unbundles) the finances of the parking spaces from the uses they serve. Assuming you need a parking space, you’d sign two leases — one for the apartment, and one for the parking space. This does two things. First, and most obviously, it frees those of us who have no car from an unfair obligation to pay for other people’s parking spaces. This can easily reduce rent by 10-20%, maybe $1000-$2000 per year. This is significant, especially for low-income households. Second, and more importantly, it creates a price signal for both developers and would-be drivers. If a developer builds 500 parking spots in a 319 unit development, at a cost of $20,000 each and can only get $500/year for each space, they’ve built too much parking, and are unlikely to even recover their nominal investment over the lifetime of the building. If, with only one parking space per unit, the rent per space goes up to $1000/year, then suddenly they’re making money. Not much though — that cashflow represents an internal rate of return of only 3.8%. To make the 8% or so that they’d like would require charging about $1700/year. Now, if you’re a motorist, I suspect you’re thinking something along the lines of “I would never pay that much for parking!” You’d just live somewhere else, right? Somewhere with “free” parking? Except that you would pay that much. In fact, you probably already do. The other place has exactly the same parking costs — you just don’t have any choice as to whether you pay them. The developer is still going to spend $20,000 to build each parking space, and they’re still going to make their 8% return on the project over all. If their marginal investment in parking underperforms, they’re just going to make up for it by charging higher rents. Worse, because residents have no incentive to use less of the valuable parking resource, apparent demand will be large, and will help to perpetuate the belief that lots of parking is required, and providing all that parking drives up the cost of future developments. With the TVAP the city has gone from imposing minimum parking requirements to imposing a cap, but without having any idea what the real demand for parking is. Without a transparently priced market, it’s impossible to know. In the 3100 Pearl Parkway block there will be a grand total of 12-16 on-street spaces. They will be managed by the Boulder Junction General Improvement District (GID) via its Transportation Demand Management (TDM) and Parking advisory boards. These boards will be made up of local property owners and citizens at large. Throughout the design process, the provision of on-street parking has been held sacrosanct. The developers threatened to walk away without it. 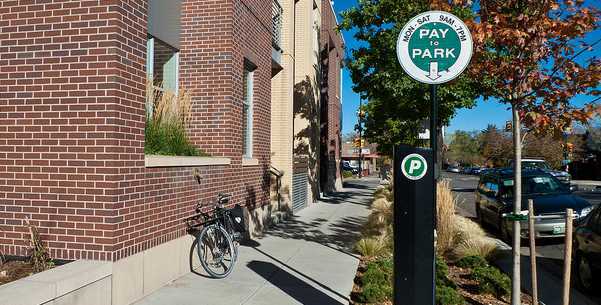 The city sees it as a way to bring activity to the street, and wants it to serve the short-term parking needs of nearby retail/commercial developments. Meanwhile, the developers want on-street spots to be available as overflow parking for their residents, whom they cannot believe will really make do with one vehicle per unit. These goals are mutually exclusive. If the spots are managed as NPP, and are essentially free, then their convenience, combined with the sheer number of residents in the area will ensure that they are always occupied, and that turnover is very low. This will render the on-street parking incapable of supporting local retail, and minimize the activity it brings to the streetscape. Serving those two goals means high turnover, and consistent availability of at least one spot per block, and the best way to do that is by metering the spots. Otherwise, these free spots will cannibalize demand for paid spots in the shared district parking structure, and encourage resident drivers to cruise for an empty spot on the (supposedly) low traffic, pedestrian friendly frontage streets. I’m not just speaking hypothetically here. In Pasadena, where I used to live, a similar transit oriented development was built straddling the light rail line to downtown Los Angeles at Del Mar. It too had restricted parking, and in Pasadena all on-street parking is permitted overnight, and available to residents for a nominal fee if they can demonstrate they don’t have sufficient space to store their vehicles off street. The city was shocked (shocked!) to discover that many residents simply requested permits, and so the reduced on-site parking had no impact on the number of cars per household. This resulted in curbside parking adjacent to the development being completely occupied, much to the displeasure of the neighbors and nearby businesses. This is a completely predictable failure, which we should avoid. If we really wanted to use the on-street parking to serve residents, the only way to make it significant would be to dedicate some of it to carshare vehicles. Zipcar, the largest carshare company in the US, estimates that each shared car substitutes for 15-20 private vehicles. Incidentally, this is also roughly the number of people who can be served by one parking spot converted into a bike corral. A single parking space in front of 3100 Pearl, if dedicated to car sharing, would do the job of all the parking spaces combined when they’re dedicated to private vehicles. Our own local non-profit car sharing company, eGo CarShare has surveyed their membership and come to similar conclusion: a large proportion of their membership either gets rid of or avoids buying a second car as a result of the service. San Francisco now mandates by law that all new developments (either for rent or for sale) larger than 50 dwelling units unbundle their parking and provide on-site parking for carsharing. The Bay Area’s non-profit City CarShare has put together a great selection of best practices and case-studies (PDF) looking at developments that integrate both of these strategies. When I mentioned the possibility of a dedicated car share spot to TAB they were supportive of the idea. Planning Board raised the objection that this would amount to allocating public right-of-way to private use. Even if it’s true legalistically, this strikes me as somewhat disingenuous. Neighborhood permit parking has the same effect, but ensures that the limited parking resource serves many fewer people. Anyone can join the car share, and it means the limited parking resource ends up serving many more people. If you want on-street spots to serve residents, it’s clearly the best option. The biggest problem with making the true cost of parking transparent is that it’s difficult to do in isolation. You can’t effectively charge for something when someone else is giving it away for “free” next door — hence the issues with overflow from the NPP on University Hill. To really work, all of Boulder Junction will have to have a unified parking market — the on-street parking, the shared RTD structure, and the underground lots associated with the residences need to have comparable prices, adjusted for how desirable they are. Otherwise, people will simply flock to the underpriced, subsidized options, and leave the ones which are appropriately priced vacant. Imagining a restaurant that was run the same way may help clarify the absurdity. The normal “free” parking arrangement in the US is analogous to everyone in the restaurant ordering whatever they want, with the bills from all of the tables getting added up and divided equally between all the night’s patrons. The 95 lb vegetarian waif and the 500 lb sumo wrestler gorging on sashimi pay the same amount. Making parking costs transparent and unbundled in just one location is the like telling a single table that they’ve got to pay their own check, but that they’re free to go eat food from other tables. This table then orders nothing for themselves, and wanders around grazing, letting the rest of the patrons pick up their tab. Neither of these arrangements is fair, and both encourage people to order more expensive food than they normally would. This is why most restaurants tend to charge people for the food that they themselves order. Overflow isn’t necessarily a bad thing, if it ultimately results in transparent pricing being implemented in adjacent areas. Eventually, as with the University Hill NPP district, the parking market becomes large enough that people just bite the bullet and start paying, or biking, or taking the bus. This assumes that they’re really committed to their destination within the parking district. The fear on the part of the city and developers is that people aren’t particularly committed to their destination. Faced with the cruel injustice of being forced to pay for their parking in an obvious way, people might decide to go somewhere else instead and pay for their parking in an obfuscated way. Fair enough. We don’t have control over parking policy in Broomfield or Longmont. Actually implementing transparent parking prices might drive some people away. But we get something in exchange — we get a different kind of city, that will attract a different kind of citizen to replace those drivers. Those new citizens are the educated, innovative young people driving us toward “Peak Car”. We Millennials are less interested in having “stuff” than having access. We’re dreaming a new American Dream that looks less like a McMansion and more like a neighborhood that makes you feel at home, with all your day-to-day needs met within a five minute walk. When you aren’t driving you never even think about parking. If we’re planning for a future when 60% of trips aren’t done by private car, when “every once in a while you see an electric car, but mostly it’s bikes and pedestrians and transit,” then we’re planning for a future in which most of the time, most people don’t care how much parking there is or how much it costs. Allowing our durable urban form to be dictated by current expectations about parking is politically expedient, but a mistake in the long run. It’s expensive, space intensive, and precludes us from building a truly livable, sustainable, human city. If we simply allow people to see how costly parking really is and give them the freedom to make transportation decisions based on that information, we will have made a surprisingly large step in the right direction. If anyone is interested in how one goes about converting between capital (up front) costs and rent equivalents, I recommend checking out this post I made about parking at Caltech a couple of years ago. And if you want to learn more about the costs and impacts of parking policy, check out Donald Shoup’s book The High Cost of Free Parking, which is finally out in paperback. Very interesting and makes a lot of sense. Being a care giver to my mother confined to travel in a wheel chair I would only say, alternatives of walking, biking, and even public transportation is out of the question. My mother’s position/condition is on the extreme other side from the “innovative young people” to which your ideas and article apply. Though the future is for the young there is still a large population of aging and less mobile elders alive. You mention 30 years hence, at which point the first of the surviving Baby Boomers will be 96. Hopefully in your world they will still be agile enough to be riding their bicycles or at least walking. An interesting counterpoint to the comment above is that my 93 year old mother has lived in Boulder, without a drivers’s licence for the last 8 years. When she gave up driving at 85, Boulder’s transit and pedestrian systems, combined with Special Transit made living without a car possible for her (unlike most of the US where the elderly become prisoners in their own homes when they can no longer drive safely). Walking has helped keep my mother healthy and independent. This discussion of the market distortions and negative consequences of “free parking” is very pertinent and informative. It is deeply disappointing to me that Boulder still requires every homeowner to provide at least one off-street parking space in almost all zoning areas. It does not matter if you do not own a car, does not matter if your house has 500 feet of street frontage, Boulder regulations still mandate an off-street parking space in a very space, money, and resource inefficient format (19 feet of driveway off the street to the parking space, hard surface and curb cut required, etc.). Why Boulder continues to waste staff time and money, scarce green space, homeowner dollars and time on this stupid, outdated requirement is beyond my comprehension. But the requirement is still in force and carefully monitored by Boulder officials when building permits are issued (see http://www.colocode.com/boulder2/chapter9-9.htm#section9_9_6). Despite Boulder’s green pretensions, car-dependent land use is still an inflexible legal mandate in our city. Superb essay, Zane. Properly managing parking is essential for a quality city, affordability, transportation choice, and quality of life. As Shoup points out, free parking is a fertility drug for cars. We need to end the biggest subsidy in America: Free parking for cars. Shoup’s High Cost is the best book I ever read in my 20 years as a town planner. Should be required reading for all planners and elected officials.